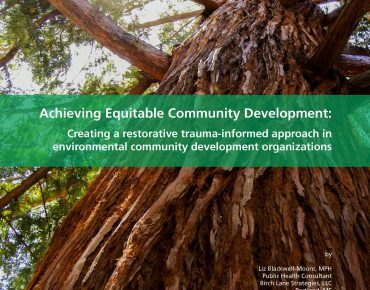 Achieving truly equitable community development requires investments in both places and people, informed by the realities of life on the ground in brownfield-affected communities and centered on people’s lived experience and their innate resilience. In the white paper below, our team makes the case for why people-centric investments are critical for achieving more equitable development outcomes. We introduce the foundational elements of a set of restorative, trauma-informed practices and offer guidance on where and how to start in integrating them in daily work. By investing first in the health and well-being of the whole individual—and, by extension, their family and community—through our programmatic work, we can disrupt the patterns of inequity that have long sidelined people of color and low-income people so they can seize new opportunities for building wealth, owning a home, establishing a fulfilling career, cultivating community, and raising a thriving family. This work is critically important for disrupting historical patterns of inequity, and it isn’t easy. Alongside workshops we’re developing to introduce the conceptual nuts and bolts of this approach, we’re beginning to convene a community of practice for those who wish to learn and do their community-building work differently. To learn more about our Equitable Development Working Group and how to get involved, click the “Submit a Technical Assistance Request” button under “Direct Technical Assistance” below.